You are a hired hero sent to save a village from an infestation of beasts ranging from giant rats to demons. With a bow and arrow this fast past action game lets you shoot down monsters as you travel and complete the 12 quests. You can also upgrade your hero after each quest. Save the village from the monsters, with 10 quests to complete. Upgrade your player after every quest. The town watch has had an alert of a band of goblins near the village. You must investigate and kill them. There are many types of beasts in this game. 'S' is up, 'X' is down, 'C is right and 'Z is left. Or you can use the arrow keys. Use the mouse to aim a shoot. Hold down for rapid fire. You can upgrade your hitpoints and arrow damage at the end of each mission with the gold you collect and are rewarded with. Aim of the game is to hunt down and kill as many monsters moving eastward (to the right) until the end of the map. If you want to play Beast Hunter games online you have come to the right place! GamesLoon adds new Beast Hunter games every week. This is your game portal where you can find the biggest collection of free Beast Hunter games online. 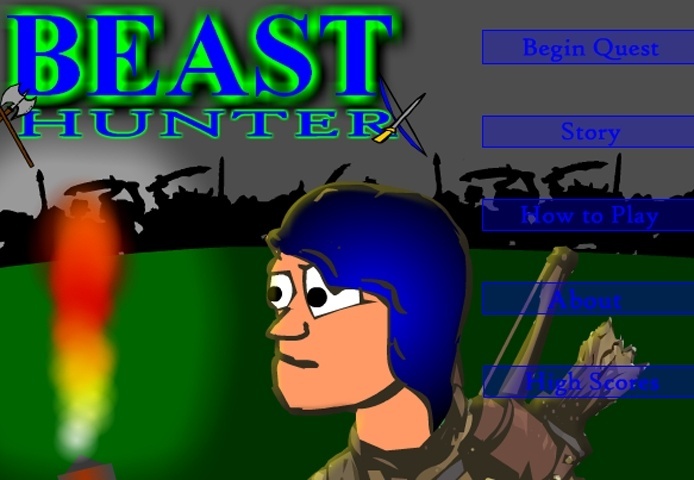 Do not forget to rate our Beast Hunter free online games while playing!